If you’ve never baked with zucchini you’ve been missing out. Everything stays so soft and moist. All thanks to a plant that you can’t taste. You can’t taste it and the only thing that gives it away are the faint green flecks. If you peeled the zucchini, you’d never know it was there. Even though they could see it, my family said they couldn’t taste it, nor could I. The muffins taste like banana bread. Perfect for all you sneaky chefs. The one-bowl, no-mixer muffins are vegan and healthy. No butter, no eggs, the chocolate chips are solely sprinkled on top, and they’re made with coconut oil. I used coconut oil rather than butter because oil keeps things softer, springier, and moister long-term. It adds a nearly imperceptible undertone that’s sweeter and more fragrant than canola or vegetable oil, but substitute with them if you’d like. I love baking with coconut oil in muffins, cakes, bread, cookies and more. I used Nutiva Coconut Oil from iHerb.com. Code AVE630 at checkout saves you $10 off your order. I love iHerb for everything like probiotics, bulk cinnamon, pumpkin pie spice, liquid vanilla stevia drops, bulk white stevia powder, medicinal fancy-grade honey, chia seeds, face cleanser, nutritional yeast, and mini chocolate chips. 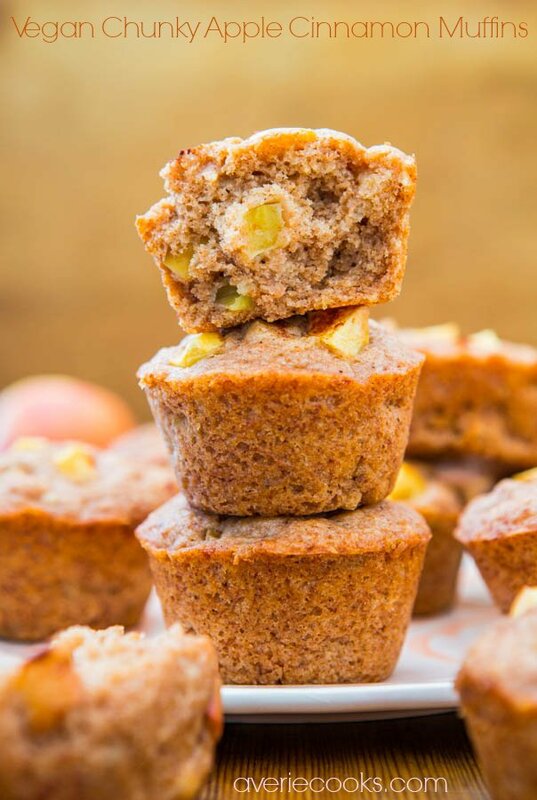 Between the softening powers of coconut oil, the creamy bananas that add tenderness, and the moisture-enhancing powers of zucchini, these are some of the softest and moistest muffins ever. They continue to get softer as the days pass, and the flavors marry together and tasted better the second day. 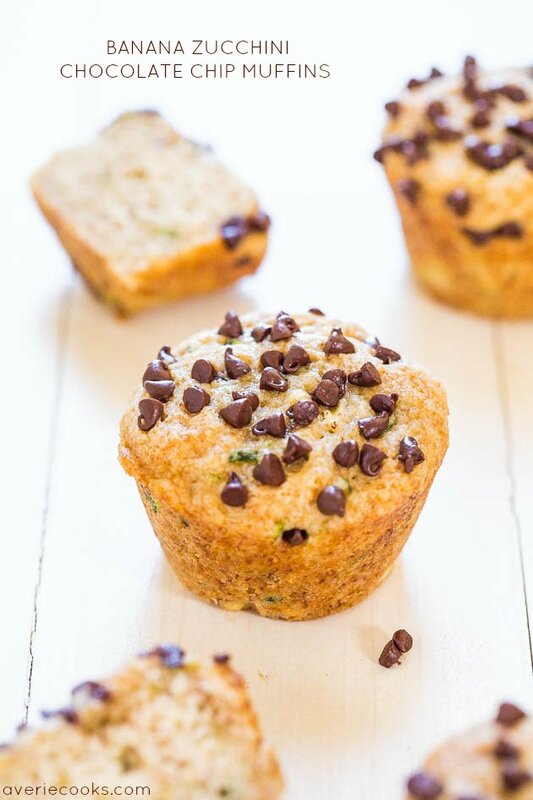 You’ll never complain about eating your vegetables after these muffins. Or hear anyone else complaining. 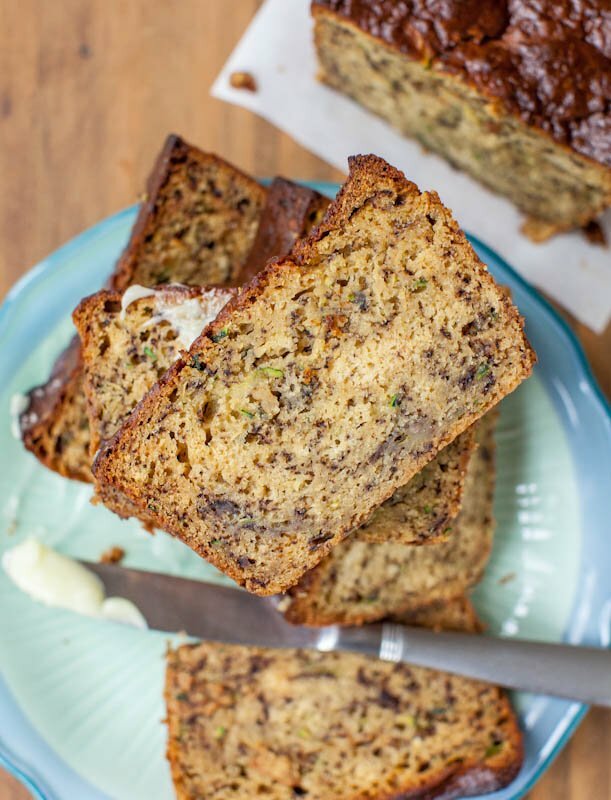 Baking with zucchini keeps everything so soft, moist, and you can’t taste it. The muffins taste like banana bread. The one-bowl, no-mixer muffins are vegan and healthy. No butter, no eggs, the chocolate chips are solely sprinkled on top, and they’re made with coconut oil. It adds a nearly imperceptible undertone that’s sweeter and more fragrant than canola or vegetable oil, but substitute if you’d like. 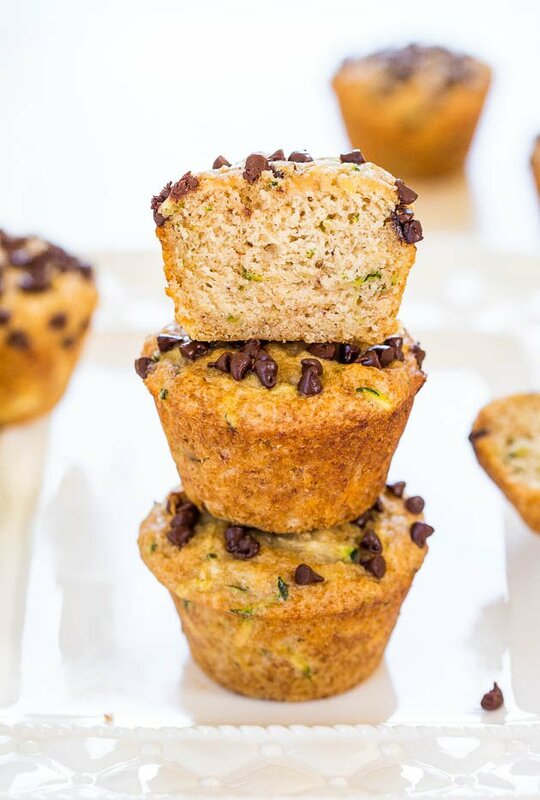 Between the softening powers of coconut oil, the creamy bananas that add tenderness, and the moisture-enhancing powers of zucchini, these are some of the softest and moistest muffins. They continue to get softer as the days pass, and the flavors marry together and tasted better the second day. You’ll never complain about eating your vegetables after these muffins. Preheat oven to 400F. Spray a Non-Stick 12-Cup Regular Muffin Pan very well with floured cooking spray or grease and flour the pan; set aside. (I don’t prefer the cosmetic look of muffin liners and I am not sure if the paper will stick to the muffins). To a large bowl, add the first 6 ingredients, through cinnamon, and whisk to combine. Add the bananas and whisk to combine. Before adding the zucchini, put it in a paper towel and squeeze tightly for about 10 seconds to remove some moisture. After squeezing, you should have about 3/4 cup of compacted shreds. Add zucchini to bowl and stir to incorporate. Add the flour, baking powder, optional salt and stir until just combined; don’t overmix. Using a large cookie scoop, 1/4-cup measure, or spoon, turn batter out into prepared pan, noting that the recipe yields 11 muffins. If I try to make 12 given my muffin pan, the muffins are too skimpy but pans vary. Each cavity should be filled to about 3/4 full, but not exceeding or batter could overflow. 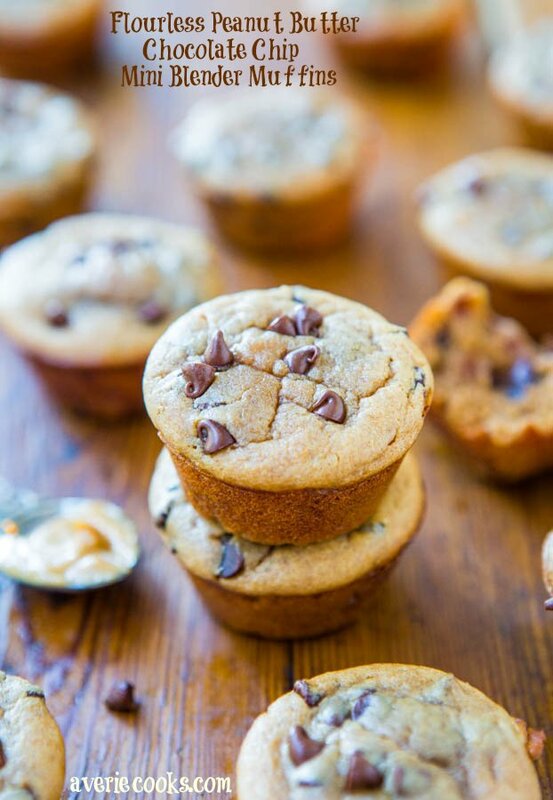 Sprinkle the top of each muffin generously with mini chocolate chips, about 1 teaspoon each. Bake at 400F for 10 minutes, reduce oven temp to 350F and bake for 8 minutes, or until muffins are set, domed, golden, and a toothpick comes out clean or with a few moist crumbs, but no batter. Allow muffins to cool in pan for about 10 to 15 minutes, or until they’ve firmed up and are cool enough to handle. It’s normal for muffin tops to be flatten as they cool. Muffins will keep airtight at room temperature for up to 1 week, or in the freezer for up to 6 months. I find the muffins get softer over time and taste better on days 2-3 after the flavors have married. Tater-Less Parmesan Zucchini Tots – You’ll never miss the taters! Crispy, crunchy, and sooo good! You’ll forget you’re eating zucchini! Thanks for trying them & glad you’re happy! Very tasty but they needed about 10 more minutes longer to cook? 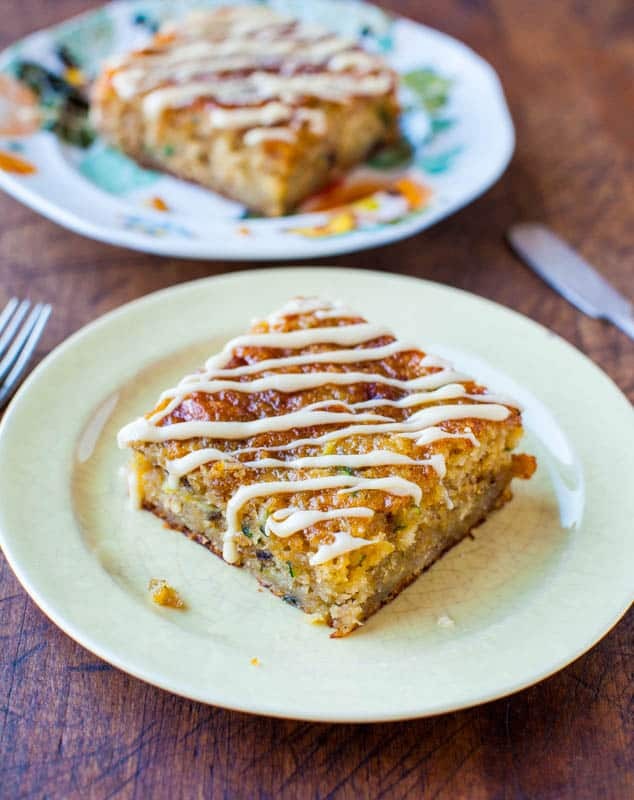 Zucchini vary widely in moisture content so that’s fine – just bake until done in your situation and oven with your ingredients, as is always the case with baking. Glad they were tasty! These muffins were so good! The only substitution I had to make was replacing the milk with water (no milk or milk alternatives in the house), and they still turned out wonderfully. The baking times and temperatures were right on for my oven. I will definitely be making these regularly. Glad they came out great even with water! That’s wonderful and glad they’ll be on regular rotation! 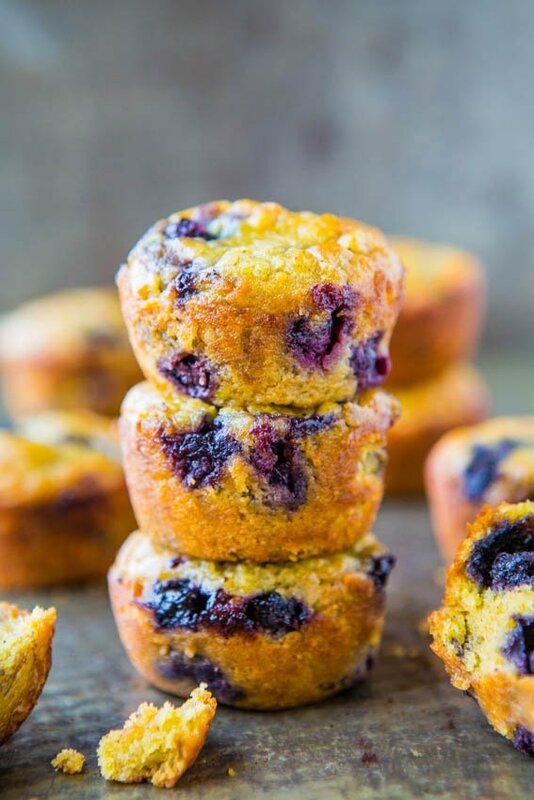 Is there a variation for this recipe for mini-sized muffins? I wasn’t sure what baking times would be best for smaller muffins. I haven’t made them as mini, and all mini pans vary in just how mini they are, so just watch them and bake til done. Enjoy! Hi! 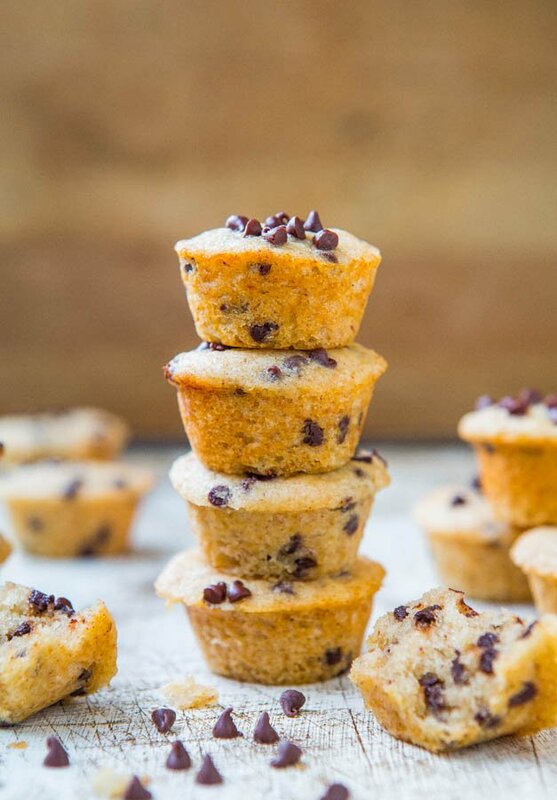 These sound amazing but I don’t have a muffin pan right now. Do you think this recipe would work for a loaf pan or would it be too dense?? Thanks in advance! Probably will be fine, although I haven’t personally tried so can’t say for absolute sure. These were absolutely awesome. I had to use up some overripe bananas, and this was the perfect recipe. 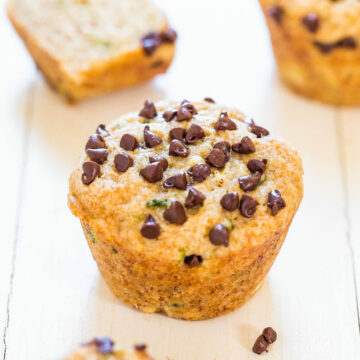 Would I be able to do these as regular banana chocolate chip muffins and just leave out the zucchini? These look delicious, but my gf hates zucchini! Crazy I know. This recipe is based on using the zucchini and without it, the recipe turn out properly. You honestly cannot really ‘taste’ it. Make a batch with it and just win her over! 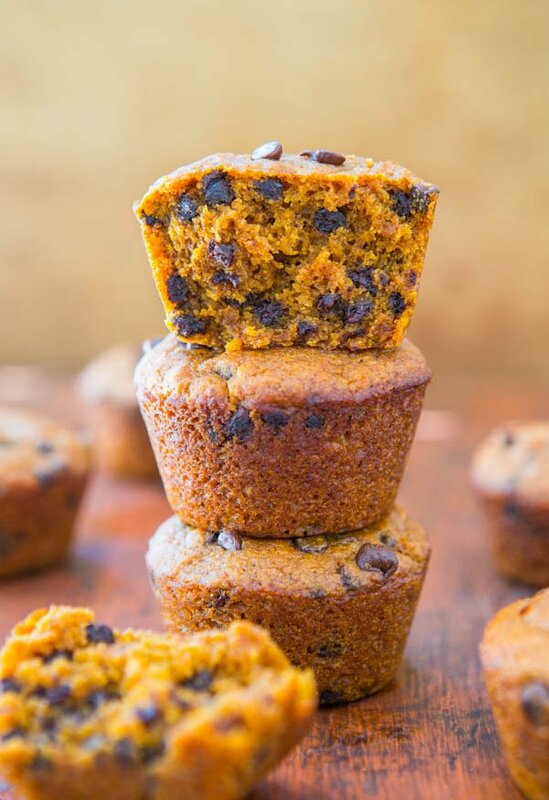 Otherwise check out these sections for more muffin/cake recipes https://www.averiecooks.com/category/bread and https://www.averiecooks.com/category/dessert/cake that will fit the bill. Have you tried these with gluten free flour? I love that they are vegan because my son is severely allergic to eggs but he’s also allergic to wheat/gluten. No I haven’t so can’t say for sure about the results but I’d try a reputable GF flour meant for baking and see what happens. I made the zucchini banana chocolate chip cookies with gluten free flour and they tasted amazing! Thank you for such a wonderful recipe! Thanks for trying the recipe and glad it came out great for you! And with GF flour, too! I don’t usually leave comments but I had to comment on these muffins. I bake a lot and try a significant number of new recipes. I had bananas to use and didn’t want to make banana bread again. In this recipe I used canola oil and cow’s milk. What I forgot was to sprinkle the chocolate chips on before baking and these muffins were great warm and great cooled; I just melted a few chocolate chips in the microwave and drizzled them over the muffins! The texture was soft and they had a nice balanced banana flavor; these muffins won’t last 2 or 3 days in my house! Thank you for a great recipe. Is there any reason you don’t mix the choc chips in with the batter before baking? I’ve always done that with other banana choc chip muffin recipes. Is it for looks that you don’t in this one or is there some other reasoning? Just was trying something new with this recipe – you could mix the chips in as well, or add more chips, if you prefer. I did add mini chips to the batter and made them in to mini muffins. I baked them for the same amount of time in the convection but kept a close eye on them. They were perfect! OMG! These muffins are incredible. I’ll definitely make again! Thanks for the 5 star review and glad you will definitely make them again! Hi Averie who cooks. I’m glad I’ve found your site too!! Have to agree with everyone else. 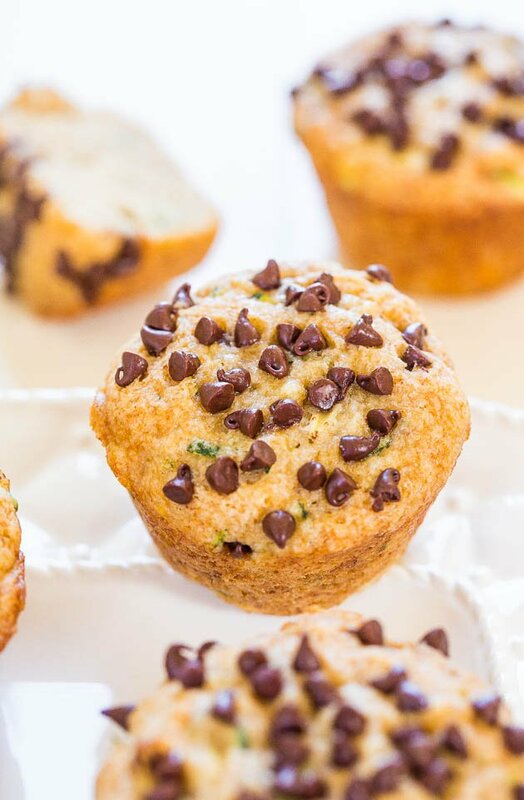 These muffins are extremely yummy! I third-ed (is that a word?) the overall sugar content, so both granulated and brown sugar, and did not add the chocolate chips; yes, I’m a mean mamma. They were still incredibly sweet and delicious thanks to very ripe bananas and a fantastic recipe. An excellent find – have pinned so I can’t do it again (I am almost willing my bananas to go squidgy)! Am now off to explore the rest of your site, the zucchini-tots are looking good, for more fab finds. YOU GO GIRL! Thanks for the 5 star review and glad you love the muffins!